Home | Newsletter 153: Action Alerts: Solidarity with Apparel Workers and Palm Plantation Workers! Take Action: Fair Fashion Not Fast Fashion! April 24th marks the 3rd anniversary of the Rana Plaza disaster, which killed over 1,000 apparel factory workers in Bangladesh. Apparel workers around the world are at high risk for accidents, injury from both equipment accidents and repetitive strain, and illness, such as respiratory disease from breathing in dust or health problems from exposure to toxic dyes. All of this in exchange for notoriously low wages, long hours, and few social benefits. The apparel sector is in need of complete upheaval, as the Fashion Revolution platform indicates, nothing short of a revolution. This will include changes in government regulations and enforcement, better international cooperation including better trade deals, brands that can trace their supply chains and support workers and independent worker organizations, and cultural shifts so that we value how our clothes are made and by whom. Check out our recent blog post for some ideas for getting involved and demanding fair fashion. Then take action. Join the conversation and share what you are doing to stand in solidarity with apparel workers. Palm oil is in half of all packaged goods. Conflict Palm Oil companies exploit workers on plantations, cheating them of fair pay and benefits, poisoning them with toxic chemicals, and forcing children to work as well. PepsiCo has failed to take meaningful action to address its Conflict Palm Oil. Every day that PepsiCo refuses to take action is another day that palm oil workers are exploited, children are working on plantations rather than in school, and ecosystems are destroyed. Will you take action to stand in solidarity with palm oil workers? Between now and May 1st, we are partnering with Rainforest Action Network (RAN) and other allies to gather a petition which will be presented to PepsiCo at the annual shareholder meeting in May. But not just any petition, a photo petition. Get a photo of yourself or a group of friends holding up a sign in support of palm workers. This will send a powerful message that PepsiCo must eliminate Conflict Palm Oil and human suffering from its products. Take action now, following these simple instructions! What once seemed impossible is now becoming reality. California recently became the first state to move to a $15/hour minimum wage. New York followed with a less comprehensive proposal that will guarantee many of the state’s workers a $15/hour wage in coming years, and others at least $12.50/hour. But workers in other states are being left behind. In February, Birmingham voted to increase the local minimum wage. Within days, Alabama’s state legislature stepped in to pre-empt the wage. To benefit workers in all states, an increase of the federal minimum wage is still needed. Thank you to all who took quick action last week on behalf of farmworkers in New York, demanding that they not be left out of the minimum wage proposal in New York. The final deal does include farmworkers, but falls short of guaranteeing the $15/hour wage they’ve asked for and deserve. Read a full campaign update. The latest edition of our free publication For a Better World will be landing in your favorite fair trade store, food co-op, Whole Foods Market, or independent natural food store soon. 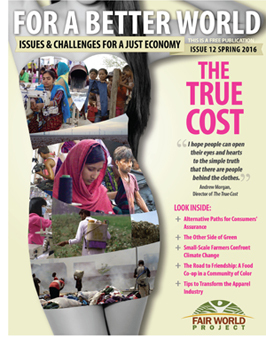 In this issue we focus on the apparel industry and include an interview with the director of the documentary The True Cost. We also take another look at carbon credit markets, offer a new perspective of fair trade cities and universities, and hear about one co-op’s journey to address food justice in a meaningful way. You can also view the publication and order a box for distribution on our website. Food companies plan to label GMOs, but is there more to the story? Free trade puts Americans out of work. The $15/hour wage might kill jobs and that’s okay. a title=” ” href=”http://bertacaceres.org/statement-from-the-family-of-berta-caceres-on-the-one-month-anniversary-of-her-assassination/#.Vv604qkEuHI.twitter” target=”_blank” rel=”noopener”> Statement from family of Berta Caceres on the month anniversary of her assassination.